The inspection, maintenance, operation, and repair of steam locomotives are a highly specialized set of skills that rely upon a balance of technical, regulatory, and innovative skillsets. FMW possesses all of the required skill sets in-house to keep steam locomotives operating reliably and safely. The following headings provide an overview of the services FMW provides its clients regarding historic locomotives. From traditional restoration to innovative rebuilding (including efficiency-increasing measures such as installation of feedwater heaters, stokers, and fuel conversions), FMW can handle any steam locomotive project, large or small. 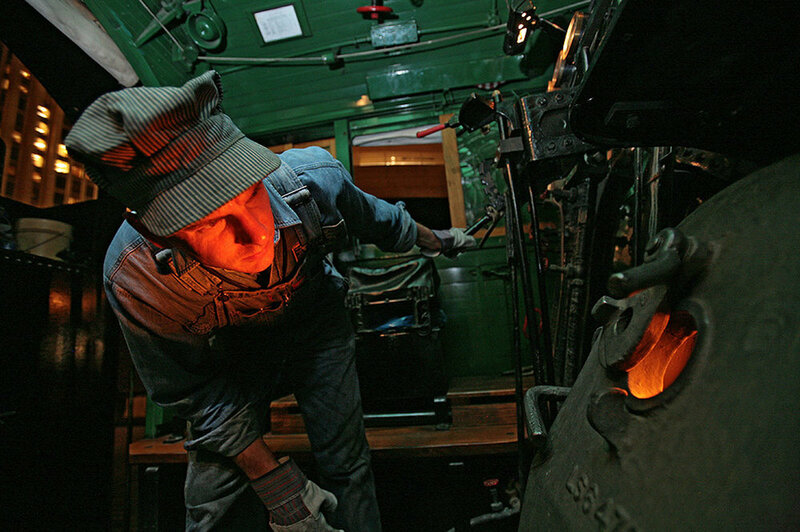 FMW co-founder Shane Meador is one of the most accomplished steam locomotive mechanics today. He has personally overseen the total restoration to operation of Southern Railway steam locomotives No. 4501 (1911-built 2-8-2) and No. 630 (1904-built 2-8-0) for operation in mainline service. Those overhauls were some of the most extensive in the U.S. in recent times, including all of the services outlined on this page. The power of a steam locomotive is derived from its driving and running gear, and ensuring the engine is in tram and maintained to proper tolerances is key to ensuring an efficiently-operated steam engine. Our team has overseen the repair, modification, and rebuilding of running / driving gear of multiple steam engines, ranging in size from 2-8-0s to 4-8-4s. We have also fabricated driving boxes from scratch and converted engines from grease cake to force fed oil lubrication with spring pad lubricators. FMW solutions is accomplished in all manner of steam locomotive boiler making and repairs. 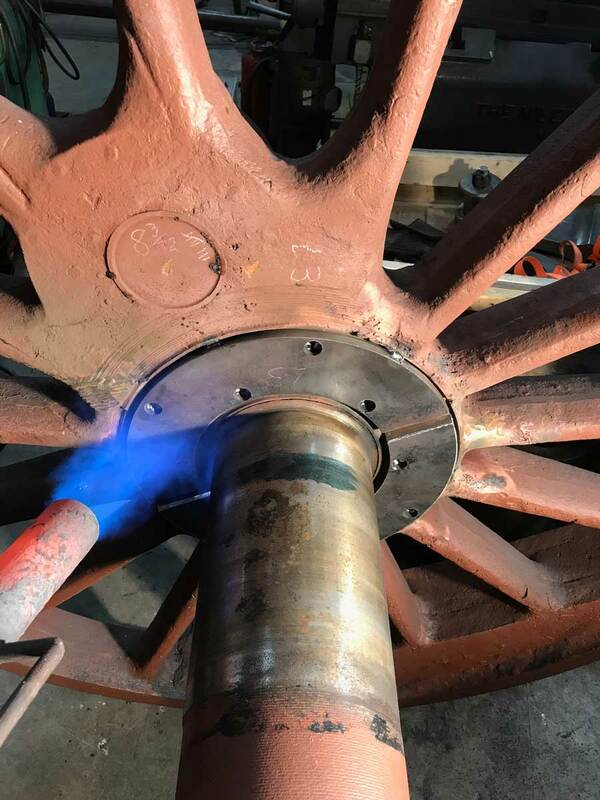 Our qualified welders, fabricators, and boilermakers are experienced in the following key aspects of locomotive boiler repair: 1) sheet flanging; 2) staybolt installation; 3) complete firebox rebuilding; 4) stoker installation; 5) oil firing equipment installation; 6) grate repairs; 7) weld build up; 8) rolled patch installation; 9) tube sheet fabrication and installation; 10) tube installation; 11) superheater element inspection, testing, repair, and installation; and 12) related steam locomotive boiler making services. We pride ourselves in the quality, and objectivity, of the work we perform on behalf of our clients, and this extends to undertaking detailed mechanical inspections of steam locomotives. Many not-for-profits and tourist railroads seek to return steam locomotives to operation, and the first step is scoping out what needs to be done to return it to operation. FMW provides all manner of steam engine diagnostic inspection and repair services. FMW is experienced in the repair of every type of appliance commonly found on steam locomotives. This experience includes, but is not limited to: 1) single stage and cross compound air pumps; 2) feed water heater systems; 3) dynamos; 4) oil burning equipment; 5) stokers; 6) throttles; 7) fire doors; 8) blow down valves and systems; 9) pop valves; 10) multiple unit (MU) diesel locomotive control systems; 11) bearing box temp sensors; and 12) related services. There are very few outfits in the U.S. that provide the breadth of steam locomotive wheel services offered by FMW. Our 50,000 square foot shop facility in upstate New York is able to reprofile and face driving wheels of any diameter - in fact we can turn stock up to 150 inches in diameter, which is much larger than any driver ever built! Also, in conjunction with additional collaborating shops, FMW is able to perform the following services: 1) tire re-profiling; 2) wheel center repair; 3) journal and hub re-facing; 4) axle replacement; 5) conversion to roller bearings (lead and trailing axles); 6) crankpin quartering; and 7) related steam locomotive wheel repair services. ...and we believe those images included on this site speak volumes. Our Team has been involved in the successful restoration, operation, and / or maintenance of nine steam locomotives, ranging in size from 2-8-0s to mainline 4-8-4s. We pride ourselves in the quality of our work and the combination of historical practices with state-of-the-art materials, technologies, and techniques. Should you want to learn more, please feel free to drop us a line.